I thought about getting a food dehydrator for quite a while. The reason I waited so long is because they are quite expensive and I thought I needed the 9 tray (shown at right) to get the most bang for my buck. I also wanted the one with the timer, until I realized that it’s a silly extra for another $75 and completely unnecessary. After a lot of internet research, I recently purchased this Excalibur 5 Tray Deluxe Dehydrator and I’m extremely happy with it. Excalibur is known to be the best dehydrator out there, although if you aren’t sure and don’t want to spend the money, I have heard that many people are happy with the Nesco Dehydrator as well. 1) I love dried fruit but they contain sulfites in order to preserve the original color of the fruit. Unfortunately, sulfites have a distinct unpleasant taste and have also been shown to possibly cause headaches, asthma attacks, and allergic reactions such as flushing, redness, and itchiness. Definitely not fun side effects of trying to enjoy some dried fruit. You can of course purchase organic unsulphured dried fruit from any local health food store but, frankly I got tired of spending $7 Cnd for a tiny bag of dried pineapple. Since purchasing my dehydrator, I’ve made dried apple, pineapple, and banana, and they all came out delicious. 2) I am obsessed with kale chips but it is almost impossible to find Kosher-certified kale chips, and when you do, a tiny container costs a fortune! While you can make them in the oven as explained here, now that I have done them both ways, I can honestly say there is no comparison to how yummy and crispy they turn out in the dehydrator. 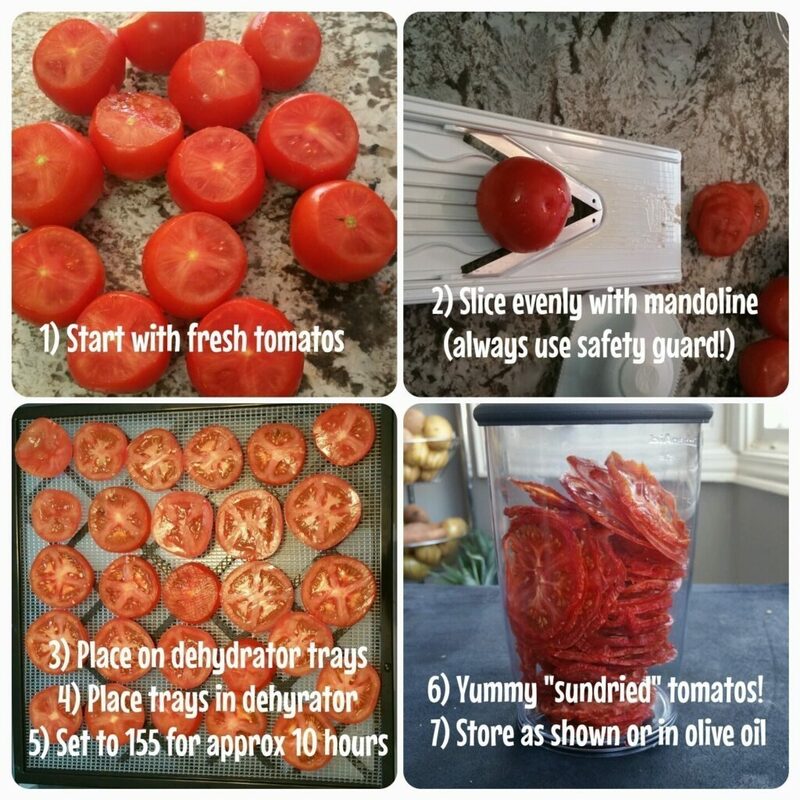 3) Sundried tomatoes add a delicious flavor to many dishes – and I prefer the taste of these freshly dehydrated tomatoes to the store-bought variety. I can also store them in organic olive oil and add the herbs that I prefer for extra flavor. Alternatively, make them a little more crispy by dehydrating for a longer period of time, store in a container and enjoy as a snack. That might sound weird but you have to try it to see what I mean! 4) Dehydrated food stays fresh for quite a while so if you have a garden it’s a great way to preserve extra fruits and vegetables. 5) Make your own fresh dried herbs and spices; I haven’t tried that yet, but I plan to in the Summer when I grow an abundance of oregano and cilantro in my little garden. 6) The Excalibur comes with this book which shows step by step instructions on how to properly make every conceivable food item turn out perfectly in the dehydrator. 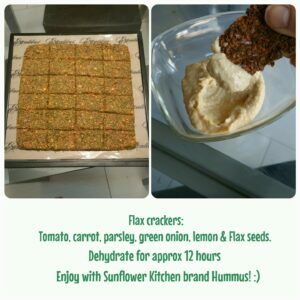 To be honest, the kids weren’t a fan of these particular crackers; On the other hand, the hubby and I absolutely loved them and ate them all in one sitting – dipped into my favorite store bought hummus of course! 8) While I haven’t tried it yet, you can apparently make your own yogurt using the dehydrator. 9) The dehydrator is the perfect place to rise dough by simply removing the trays and setting to the lowest temperature. 10) If you are so inclined, you can make your own Kosher beef jerky. The only problem is, you would then need 2 dehydrators if you are strictly kosher. Yikes! Much to my 14 year old son’s disappointment, I will not be making beef jerky anytime soon. Best of all, using the dehydrator is fun and easy – and the kids love to help! 1) It’s quite large and my kitchen isn’t big enough; there is simply not enough room on the counter. I tried putting the unit in the living room, but it was a real eyesore, so I nixed that idea. I know some people use their laundry room, but since mine is in the basement, it’s not very practical. In the end, I settled on my family room near the fireplace which seems to be working well so far. 2) Some foods dry at different times and temperatures than others so if you make 2 trays of one type of food and 3 trays of another, you will have to check it periodically and remove the trays that are ready. For this reason I am finding it a lot easier to make 5 trays of one type of food rather than to try to mix and match. 5 trays seems like a lot but when the food is dehydrated, especially if you have a family, it gets eaten a lot quicker than you might think. 3) Initially, there is quite a bit of an investment especially if you don’t already own Mason jars to use for storage, a Mandoline slicer – evenly sliced food makes drying times quicker and more reliable, an apple corer or a pineapple slicer & corer if you plan to dry those food items. I also recommend getting the Paraflexx sheets mentioned earlier in this post if you want to make your own fruit leather/fruit roll-ups or flax crackers. 4) It takes time for the food to be ready so you have to be patient. This was definitely hard for me at first and I was eating some of the food in the middle of the cycle. I’ve gotten better though. All in all I am very happy with this purchase and I hope this helps you decide if this would be a worthwhile addition to your kitchen appliances! I would love to hear if you have one, what type, if you are happy with it and what you have made in it.